I meet up with a long lost classmate from high school, Maria Czaplicki, on Facebook a month or so ago. What a wonderful age we live in! Blogging and social networking opens up our world to so many friends and experiences! Maria just got a new addition to her family, a Cavalier King Charles Spaniel puppy. What a neat breed! 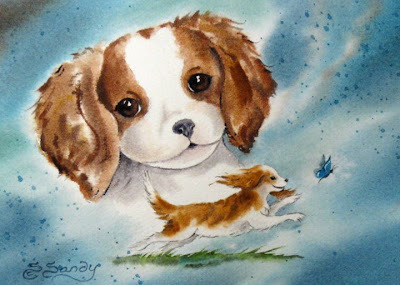 From Wikipedia: "The breed is highly affectionate, and some have called the Cavalier King Charles Spaniel "the ultimate lap dog" or the "love sponge" of dogs. Most dogs of the breed are playful, extremely patient and eager to please. This breed is one of the friendliest of the toy group. Some Cavaliers have been known to exhibit traits in common with cats, such as perching in high places (the tops of couches, the highest pillow, etc), cleaning their own paws and can also show some birding qualities. 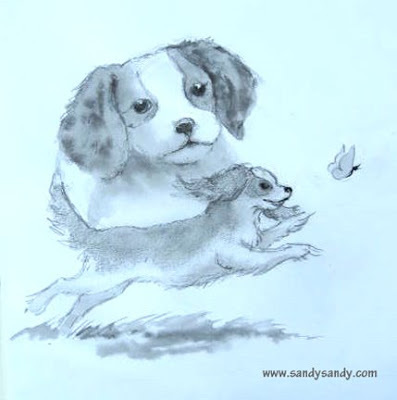 It is recommended that care should be taken when walking a Cavalier off-leash, as they can single-mindedly chase a butterfly or rabbit onto a busy road or other dangerous situation without regard for their own safety if not properly trained." This inspired the above sketch done from her posted photo which I quickly sent off to Maria. It is very good at drawing animals. You've captured personality. That is SO hard to do. Wow! What a talented artist you are! It is a great painting. We love it!